It was a big night in round four of the Premier Squash League, with most of the top players back in action after the hectic Autumn schedule of World Series events, and all the teams looking for wins to send them into the winter break in good heart. In Group A Birmingham University were hoping the fervent home support would help them to a second win, but visitors Oxford soon dashed that prospect as they took a 3-0 lead at the bottom of the order, eventually winning 4-1 to move into third place in the table. 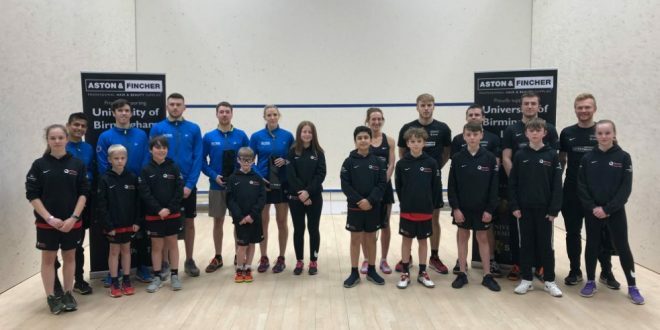 It was the same story at Nottingham as the home side neutralised Pontefract’s ‘big guns’ at the top of the order, taking the first three ties to clinch the victory – Emma Beddoes with a fine win against Vanessa Atkinson, and Lewis Walters coming from 2-0 down to beat Simon Parke. Nottingham won 4-1 to keep them in second place behind unbeaten Duffield, who had a night off. In Group B Exeter and St George’s also wrapped up the points early, going 3-0 up against Bristol and champions Surrey H&R respectively. Surrey took the last two – both all-English – matches courtesy of Adrian Grant and Peter Barker to limit the damage a little, while Stewart Boswell, playing his last PSL match after announcing his retirement a week ago in Kuwait, signed off in style with a 3-0 win to out Exeter 4-0 up before receiving a “very emotional” presentation in front of the packed Exeter crowd. 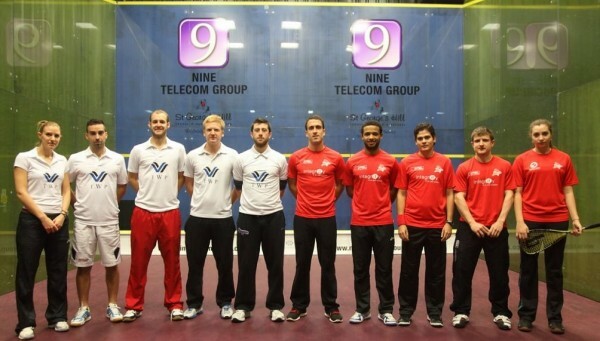 The last match – “the best I’ve ever seen” according to one observer – saw LJ Anjema beat Mohamed El Shorbagy 11/9 in the fifth, well after midnight, to give Exeter maximum points. Those results combine to take Exeter top of the table, but it’s pretty congested up there. At Chichester it went down to the wire, 1-all, then 2-all as Alex Gough squeezed out a 3-2 win to level the match against Winchester, leaving it to Nafiizwan Adnan to clinch the points for the home side with a 3-0 win over world junior champion Mohamed El Shorbagy. Chichester leapfrog tonight’s opponents to go fourth.